Alba Wall Mounted 7-Tier 21-Pocket Literature A4 Holder Chrome DDFIL21M – ALB00767 – OfficeYoo! Perfect for use with magazines, corporate literature and brochures, the Alba Wall Mounted Standing Display is great for all businesses. 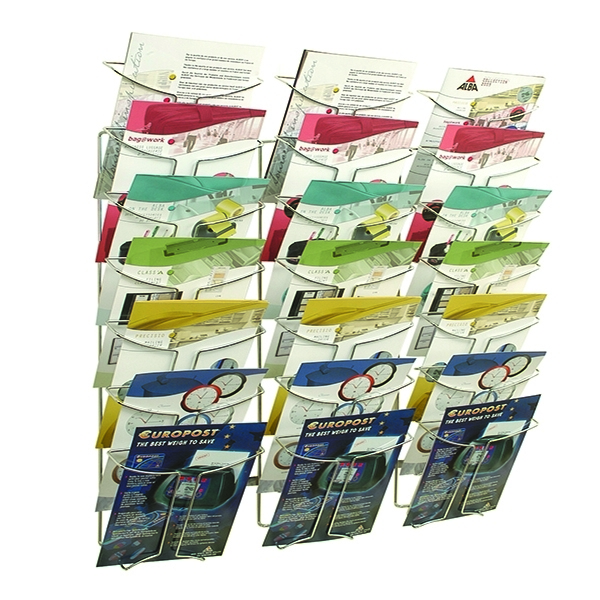 You can encourage visitors to learn more about your business using the 21 pockets (three tiers of seven) for A4 literature and magazines. Manufactured from durable chrome-finish wire and with a contemporary design, this display is designed to last and suits any decor. It comes with a fixing kit for easy installation.